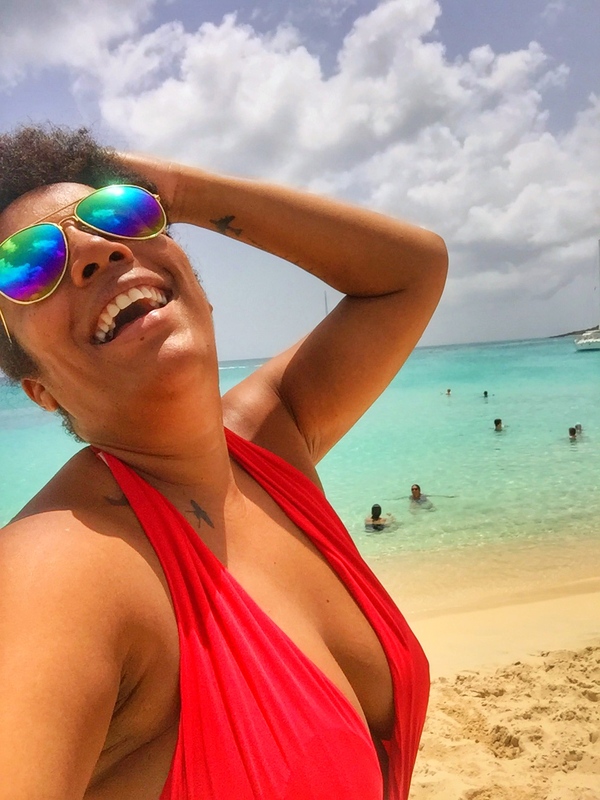 I am a big fan of small Caribbean businesses and this list includes some of my favorite Caribbean brands and small businesses ran by ambitious islanders. So this Holiday season: Support local, shop Caribbean. Kallie Mihalos recently decided to put her creativity to work and started her own line of handmade, hand painted and crochet handbags and accessories, made mainly from burlap and denim. The results are stunning handbags and clutches. I myself am completely and utterly in love with my skull handbag and cannot wait to own some more of Kallie’s designs. Burlap bag with hand painted denim skull, floating fringe and pink tassel and fully lined with a cell phone pocket. Made of denim, with hand painted denim skull, floating fringe and fully lined with a cell phone pocket. Burlap bag with crochet evil eye floating coins and green tassel and fully lined with a cell phone pocket. Handbags start at $65 and can be ordered by email or by calling Kallie directly at +1 (721) 581-7697. Visit her website for more amazing designs. Island Blush is a trendy boutique in the heart of Philipsburg, Sint Maarten. This exclusive shop offers resort wear and accessories, gift items, cosmetics, natural hair and body products. It is a store I visit often. The good news is that now you can too. Island Blush has recently launched their online store, making their goodies accessible for women all over the Caribbean and beyond. Island Blush’s very own nail lacquer provides a high shine, chip resistant and glossy like finish and is certified by PETA as part of their “Beauty without Bunnies” program, making it completely Cruelty Free. Simple and elegant Mantra bands with uplifting and inspiring messages. Serve as daily reminders, affirmation and positive inspiration. Available in gold, rose gold and silver. Trendy accessories that merge style and functionality, with eye catching colors and simple designs. They can be used as your favorite cosmetics bag or as a clutch or small purse. Perfect for the island woman on the go. Visit Island Blush’s online store or send your order by email. Browse through the beautiful photos of their other items on Facebook and Instagram. Another one of my personal favorites is Fashion Cuts. These trendy handmade earrings and necklaces by my friends Vanessa and Daryl Thompson or as I like to call them, Anguilla’s super duo are made out of wood, acrylic or leather. The wife and husband team uses a laser machine to cut and burn the product with precision to achieve the desired result. Fashion Cuts has proved to be a big success since its launch in 2010. Roaring 20’s, Gold color and made from wood. Trapeze (shoulder dusters). Bronze color and made from leather. The Archeress. Gold color and made from wood. Visit Fashion Cut’s website, Facebook page and Instagram account for more of their beautiful handmade jewelry pieces. You can also contact Vanessa and Daryl via email. St. Maarten Nectar’s founder Nalia Muriel started this now well known company in her kitchen, with one pure objective in mind: To provide superior skincare products produced solely and exclusively on St. Maarten. I can attest to the fact that Nalia is one hard working island chick. Made out of the highest-quality natural ingredients St. Maarten Nectar’s products are carefully crafted by hand in their lab. In above picture: (1) Body & Hair Roucou and Carrot body and hair oil. Enriched with coconut, avocado and almond oil. (2) Natural facial creams with SPF, perfect for the female island hopper. Available in carry-on size. (3) Body aromas in easy to carry and apply roll-on form. Choose form 11 different perfumes, from subtle to rich and from citrusy to flowery. All inspired by the island’s vibrant flowers, fruits and aromas. *St. Maarten Nectar products are all organic and natural and are nit tested on animals. Visit St. Maarten Nectar’s beautiful website for a full list of all of their amazing products. Place your order with Nalia and she will make sure to ship it to you. Tijon is a one-of-a-kind boutique parfumerie headquartered in Grand Case, French St. Martin specializing in their own line of handcrafted fragrances. What is so special about Tijon is that you can actually visit their Perfume Lab in Grand Case and design your own signature scent. For those of you not on St. martin at the moment, don’t despair. Their online boutique has an array of perfume and perfume-related gift items worth checking out. Give the traveling island girl in your life the gift of scent. Relief Oil Set of 4. Also available individually. Best selling relief oils include Migraine relief, Arthritis relief, Allergy relief and SleepAid. Pendant Scent-able Bead. Gold or silver plated necklace with unique ceramic bead that can be scented. Visit Tijon Online or email them for more information or to place your order. The Filthy Mermaid is a monthly subscription service for women who love all things mermaid – with an edge. They deliver “got-to-have goods for mermaids gone bad” in their monthly Siren Swag Bags. Members receive 3-5 pieces of siren swag each month (a $30+ retail value in every box!) for $19.99 per month. Also available on their website is their apparel line (shirts, hats, and more) as well as gift cards. This monthly Swag Bag makes the perfect gift for that naughty traveling mermaid in your life. Visit The Filthy Mermaid or email them today to find out everything about their boxes and featured products. Follow them on Facebook and Instagram for fun mermaid humor as well as beautiful mermaid related products. The Sunshine Society is another monthly subscription box for whether you live on an island, or just do in your soul. This makes a great gift for the island girl abroad or those that carry the island life with them at all times. Members receive 4-6 hand selected island gifts each month (a $70+ retail value in every box!) for $45/month. Boxes are cultivated for women by island women and sent directly from the Virgin Islands. Boxes feature unique themes, varying tropical destinations, and a connection to the fascinating women who call them home. Also available in their online shop is their signature tropical skincare line and gift cards! Check them out online or email them for more information. The Sunshine Society is also on Facebook and Instagram with beautiful photos illustrating the island life. Renee and Ken followed their dream and moved from the US to Anguilla about 3 years ago and opened Limin’, a boutique that offers its customers memories to take home from beautiful Anguilla. Or in this case that reminds the eternal island girl of home while she’s away. Their products are beachy-chic with a light and airy feel. Custom totes, wine bags, wristlets and messenger bags designed from the sails of the majestic Anguilla racing sailboats. A personal favorite: hand designed jewelry made form the sands of Anguilla. Sterling silver necklaces, bracelets, earrings, and rings. Be sure to visit their Facebook page or contact them via email to place an order. Renee and Ken will be happy to assist you. Also ask about their hand made soaps. Yourandell Provence discovered stitching about one and a half year ago and developed a passion for sewing. After designing his very own first clutch, a trendy evening clutch, it was clear that the hobby was no longer a hobby but a brand. His slogan “Feel Unique wearing Y.P.” says it all. No two designs by Yourandell are the same thus making every single piece sold uniquely yours. Especially for this Holiday Season all items are designed according to the African fashion style or with African printed fabric. Order one of their unique skirts or clutches now on Facebook or by phoning +1 (721) 587-2850. The Garota Tropical store has been open since 2006 in the capital of French St. Martin, Marigot and offers bikinis and beachwear, handmade flip-flop sandals and handmade resin jewelry. Their collection is not only unique but amazingly beautiful. What traveling island chick doesn’t pack at least one piece of swimwear when going on a trip? Just visit their Instagram page to see what I am talking about. Or send your order to Brice by email. You cal also call the store at +590 690 34 60 40. I left one of the top gifts for last. Nothing says Happy Holidays better than tickets to this annual EDM event in Curaçao (hint hint hint to all my family and friends). Su’legria, Papiamentu for “His or her happiness or joy” is the number one leading dance event on the island blending the electronic beats of house music with just the right touch of Caribbean flair. It’s a night when everyone can “let go” and forget the burden that the daily life carries. Plus, you don’t want to miss their spectacular firework show that accompanies the event. Take it from me, I have seen it with my own eyes and have experienced the complete professional event that is Su’legria. It has become a tradition and a new way of celebrating the new year on Curaçao. It takes place every first Friday of the new year. The next will be on January 6th 2017. For more information visit the Su’legria website. For tickets visit Tickets Caribbean. For table reservations email the VIP department and follow the preparations to the event on Facebook and Instagram. Which item on this list did you like the most? Happy Holidays and remember to Live, Laugh and Travel often. Great stuff. Was looking for gifts for our “island girl” staff! Now I know what to get and support local biz taboot!!! Awesome. Glad I could be of help.